The SPWF04SA (integrated antenna) and the SPWF04SC (external antenna) intelligent Wi-Fi modules represent a plug-and-play and standalone 802.11 b/g/n solution for easy integration of wireless Internet connectivity features into existing or new connectivity products. Configured around a single-chip 802.11 transceiver with integrated PA and comprehensive power management subsystem, and an STM32F4 microcontroller with an extensive GPIO suite, the modules also incorporate timing clocks and a voltage regulator. 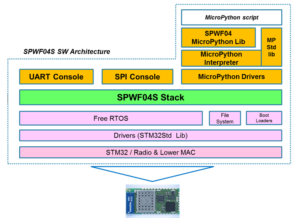 The SPWF04Sx parts are released with an integrated full featured TCP/IP protocol stack with added application service capabilities and an integrated uPython scripting engine to enable custom application development within the module. 1 MB of the internal Flash is dedicated to store the user file system while an HW interface is provided to allow the usage of an external memory to extend the file system storage capabilities with no size limit. 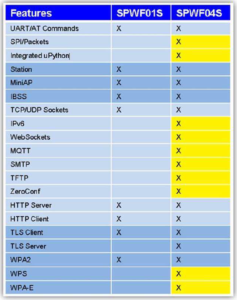 The figure below summarize the possible integrations of a module SPWF04S in a user target application. 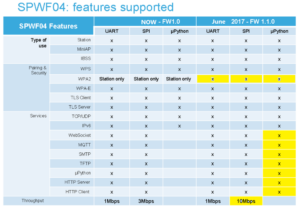 The complete SW architecture of SPWF04S is showed in Figure below. 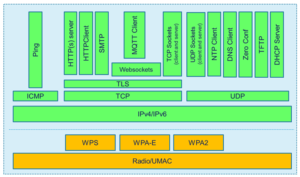 The Block Diagram of the SPWF04S Protocol Stack is shown below. 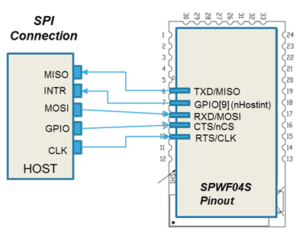 SPWF04S supports two interfaces, UART and SPI, that allow connecting the module with an host processor. The pins to be used in the two possible configurations are indicated in the Table below. 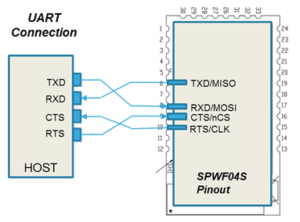 By default, SPWF04S works using the UART port with AT commands. To switch on SPI the pin correspondent to GPIO must be driven low at the boot time, that forces the device to handle incoming commands over SPI instead of over the UART. UART InterfaceSPWF04S can be interfaced with an external host using UART interface as shown in Figure 2. This configuration is used by default. In particular there are 4 signals including RTS and CTS for HW Flow Control. SPI InterfaceThe SPWF04S can be interfaced, as a slave, with an external host by using the SPI interface as shown in Figure below. In particular there are four SPI signals and an additional signal for host interrupt. This Interrupt signal allows the SPI slave to alert the SPI master that it has data to send. FOTA is used for firmware (concerning the WiFi module) & software (concerning user program) update via WiFi network. FOTA is available also in uPython. The UART console provides a user friendly interface built on a set of AT commands that allow an external Micro connected to the SPWF04 UART to access the functionalities integrated in SPWF04S device. UART is set as the module default interface. The Device can be connected as a slave to the SPI interface of an external Micro. Ad hoc SPI protocol and correspondent packet format are defined. 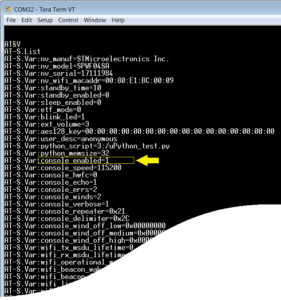 ”console_enabled = 3” – to use MicroPython only. The Device implements a scripting methodology based on an integrated MicroPython interpreter. MicroPython scripts can map a target application making unnecessary the integration of the Device with an external processor. The last Firmware Package (1.1.0) for SPWF04Sx modules is here but is available only for AVNET-SILICA internal tests.